How Do Credit Cards Differ from Prepaid Cards? Many Americans have become focused on paying off debt and saving more money as a result of the troubled economy. One of the ways they are doing this is by cutting back on using credit cards in favor of prepaid cards. The Washington Post reports that consumers put $8.7 billion on prepaid cards with Visa, MasterCard, American Express, and Discover logos in 2008, compared with $4 billion the previous year, according to research firm Mercator Advisory Group. Thinking about using a prepaid card? Here's how credit cards and prepaid cards differ. Anytime you make a purchase with a credit card, you are borrowing money from a lender. You are agreeing to pay off the purchase at a particular interest rate later. If you don't pay off the balance in full at the end of the month, interest will accrue. Since some credit card rates can be quite high, use of credit cards can lead to huge levels of debt. Credit card companies take a risk lending money to people, so in particular, people with weaker credit pay higher interest rates for credit card debt than those with good credit. Prepaid cards can be a helpful tool for people trying to better budget their money. But there can be many fees associated with these cards. Consumers Union reviewed the terms of 18 prepaid cards and found that activation fees ranged from $3 to $99.95. Monthly fees ranged from $2.95 to $9.95, balance inquiry fees ranged from 50 cents to $1, and inactivity fees ranged from $1.95 to $9.95 a month. Other charges are often involved with prepaid cards, such as overdraft and customer service fees. 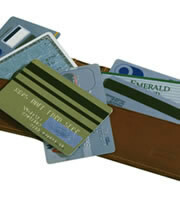 Credit cards are protected if they are lost or stolen. However, people who use prepaid cards do not receive the same protections that allow debit card users to recover their money. It's important to ask about all policies and fees before signing up for a prepaid card. 0 Responses to "How Do Credit Cards Differ from Prepaid Cards?"